Aadab Main Premchand Hoon series was followed by yet another series where we staged plays on short stories written by Gurudev Rabindranath Tagore. His stories mostly borrow from deceptively simple subject matter: commoners. 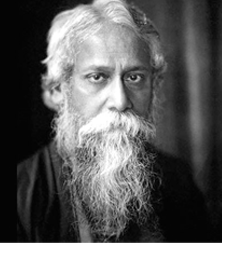 Tagore’s body of literature is deeply sympathetic for the poor and upholds universal humanistic values. To meet the different tastes of the audience we began the series “Mant Ka Deewanapan” where the stories were bold and no part of human existence remained untouched, he sincerely brought out stories of prostitutes and pimps alike, just as he highlighted the subversive sexual slavery of the women of his times. Trimurti series was a compilation of stories of all three writers Munshi Premchand, Rabindranth Tagore and Sadat Hasan Manto. This began when people who loved Munshiji missed him at the time series such as Main Rabindranath Tagore Hoon and Manto ka Deewanapan was started. In order to satisfy the literature hunger we decided to begin Trimurti and stage plays of all the three writers together. Mujeeb Khan is the pioneer of journalistic theatre in India. IDEA actively supports “Journalistic Theatre” and dutifully, as a service to mankind performs street plays based on various ongoing social issues like Corruption, HIV Aids, Malnutrition (Kuposhan), Importance of School, Education for all, Women Empowerment, Save Water, Ragging in Colleges etc. at various locations ranging from the schools and colleges of Mumbai, to the slums of Dharavi, to the suburban railway stations like CST, Wadala, Andheri etc. to the streets of remote locations like Bhiwandi and Kalyan on the out skirts of Mumbai City and this is not limited to the city of Mumbai only, the actors from IDEA have performed these plays at various venues, numerous times across the country.